Just a quick post to let you know that Canon have released their Christmas papercraft collection. They always have a great range of papercraft from easy to challenging. If you want easy then there are some Santa tree ornaments or if you want a challenge then there is the Dancing Santa mechanical toy. Well worth a visit to grab a few models and other ideas. Remember to get them now before Canon remove them for something else. I’ve had this in my collection since I picked it up as a sales item after Halloween last year. It seemed the perfect time to build it. 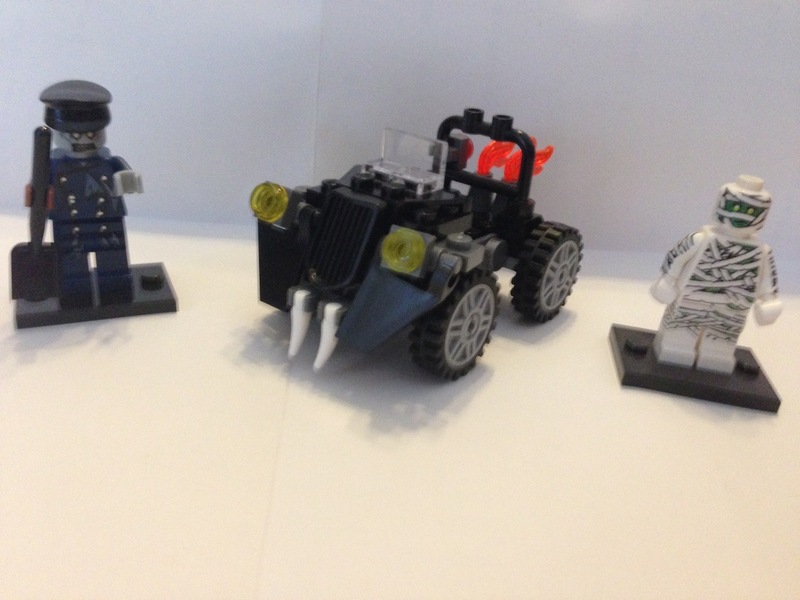 The Monsters Fighters Zombie Car (Lego #40076) goes well with the Mummy minifig. Recently it was Jessica’s 21st and I found myself wrapping 21 gifts. I decided to create the wrapping for a few of them rather than use wrapping paper. You can see the results. 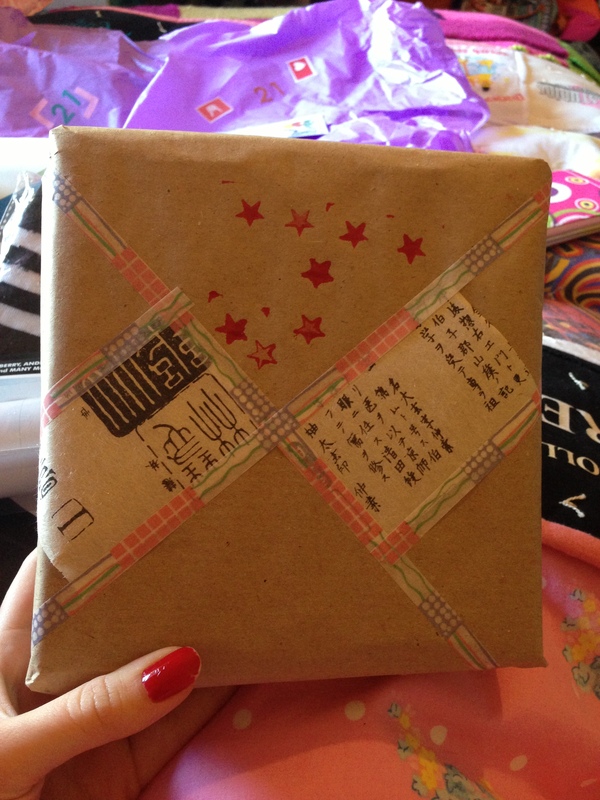 A combination of washi tape, printed rice paper and a star stamp on brown paper. 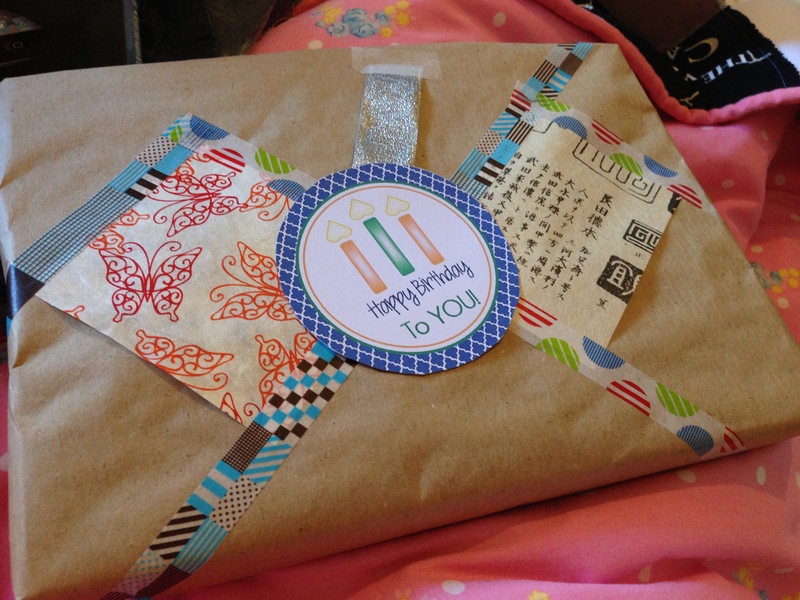 A combination of washi tape and printed rice paper on brown paper. You can also see a round gift tag I printed onto a light card and cut out. 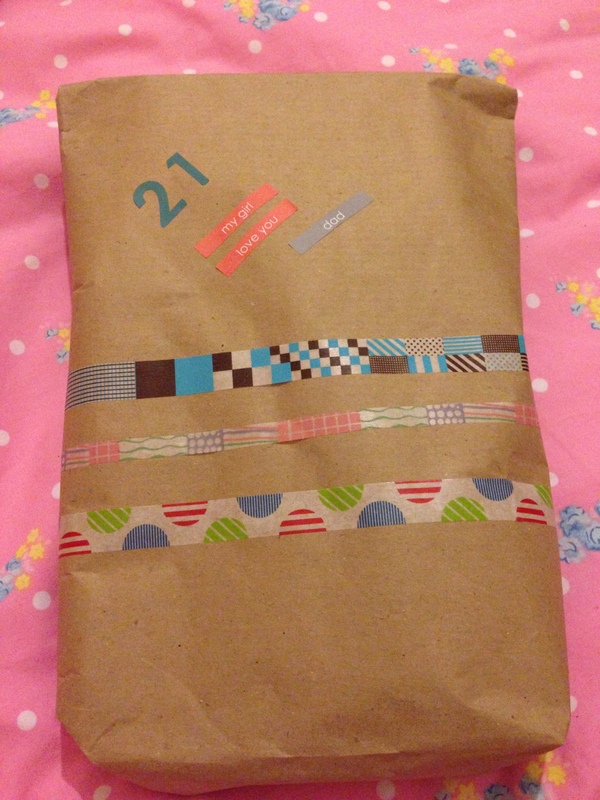 This is actually a bag and the washi tape wraps right round. The “21” and the words at the top are stickers I found in a stationery store. For this I used brown paper, printed rice paper, washi tape and some stickers and stamps. The brown paper is not the brown paper you get in the supermarket but craft grade. It is thicker and has a lighter, more consistent colour and works a lot better for craft than the cheaper supermarket stuff. I’ve found kids prefer wrapping based on white paper and you can get good quality white paper in rolls from Ikea or a good kindergarten art supply store. Washi tape is a Japanese masking tape that comes in a large number of colours and patterns, the usual width is 15mm but you can get it both thinner and thicker (you can now get it as wide as 100mm for use in home decorating). It is usually quite thin, to the point of being translucent, and sticks a lot less than traditional sticky tape. The most common brand is ‘MT’ who I am told developed it but others now produce it. If you look around you might be able to find it close to you but if not a lot of places sell it online. I get mine from the excellent Pentimento in Newtown. Online in Australia the best range of MT tape would be at Notemaker while Craft Queen has an excellent range of tape from some other sources. I also keep my eye out in other stationery stores. While it isn’t washi tape you can often find patterned sticky tape in $2 stores and in Japanese gift stores. I have some of these in kid patterns such as Winne-the-pooh, Snoopy and Hello Kitty which work well enough on children’s gifts. The printed rice paper was a marvellous find at Amazing Paper in Enmore. They have this great looking paper in A4 sheets and a few patterns. It’s not cheap at $1.65 a sheet but I can use one A4 sheet on a number of gifts as I use it as just a patch of pattern. Amazing Paper sell some great papers online (including a nice little bag of offcuts) though personally I like to feel it so I go to the shop. If you can’t find something similar then you might find some nicely textured and coloured gift paper that will do the same thing. The rubber stamps I own have been collected over many years from a number of sources. You can find surprisingly good sets in $2 stores and supermarkets with stationery stores supplying more interesting and eclectic ones at much higher prices. The stamp pads are Ranger brand archive quality, they are in all sorts of interesting colours and were first found at Pentimento but I’ve found that CraftOnline have the full range of colours at a great price (they also have a good range of washi tape and washi sheets I’ve seen nowhere else). Now if you read all that you can see that spending a lot of money on tape, paper, stamps and pads is possible. I’ve avoided this by just buying one or two pieces every time I know I will be doing some wrapping. Once you have a good supply you will find that the cost drops off to almost nothing. The photos here show only the front of the gift, mostly I concentrate on getting that looking good and ignore the back. The one difference is where I decide to create a gift bag, then I try and get the whole thing looking good. A few tips for you on how to do that. Grab a large paperback book or box similar in size to the bag you will make. Cut a piece of paper large enough to wrap the book and a little more on the long side. Fold paper around the short side and fold the edge of the overlap so you get a good straight edge and tape into place. Slide the book down so at the bottom of the bag you have slightly less overlap than the thickness of the book. Fold the overlap down and pinch in at the left and right ends. Let go. Flip the book over and repeat the folds. Now you can fold both front and back in and tape into place. Decorate the bag taking care to pay as much attention to the front and back of the book – you can see I’ve used a pattern that can easily wrap right round. Now carefully up end your bag and let the book slide out the untaped top end. Last weekend a long time friend of mine came over and was helping me do some organisation of the shelves in my lounge room. He came upon a small pile of hexaflexagons and asked what they were. Despite all evidence to the contrary I’ve always thought of myself as terrible at mathematics. My view is entirely due to the terrible state of Maths education in Australia in the 1970s and the terrible High School I went to. I never did get the hang of algebra in my second year and from that point on I was lost. I’ve always had a fascination with puzzles and patterns. 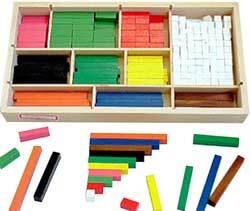 When I was small it was my Spirograph, string art and Cuisenaire rods then it was Martin Gardner’s book ‘Mathematical Puzzles & Diversions’ – the first chapter devoted to hexaflexagons. I remember my brother and I both littering the house with them. It reached it’s height when I was 18 and meant to be studying for the final high school exams. Instead I spent two months studying Rubik’s cube to develop my own solution and a set of transforms for a dozen or so patterns. Since then it’s been the odd outbreak of fascination with something but never the single minded dedication of those two months. So I have done some incredible things over the years, just don’t tell me it’s maths and I’m hooked. It was last year my favourite YouTube recreational math freak Vi Hart celebrated Flexagon month by shooting a few videos dedicated to them and I just had to make some of my own and go through all that fun again. If you enjoy recreational maths or puzzles you should have a good look at all her videos. Until then get yourself a paper strip, make a hexaflexagon and get flexing. 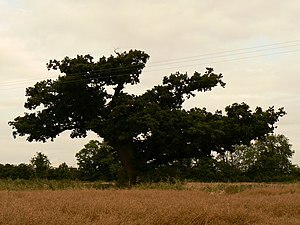 Written in response to this week’s Weekly Writing Challenge. I know this blog isn’t for my technical and computer stuff but this is about papercraft. Foldify, the papercraft app for the iPad I have previously mentioned has had a major update. Go to my other blog to read all about it. I’ve finally built the Lego sets I received for Christmas from Jessica. 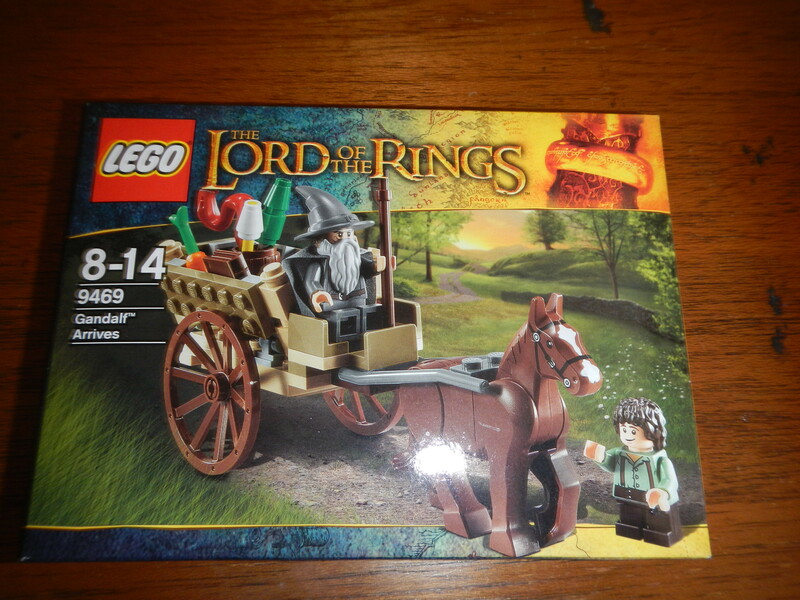 The first was the “Gandalf Arrives” set from the “Lord of the Rings” series. This is a nice small set, the box doesn’t say how many pieces but I’d guess less than 100. Lego have rated it as an over 8 years old build and I think that’s fair as it has a few tricky spots that might confound younger builders. I’m getting a bunch of visitors looking for Xmas pop up cards so I thought I’d put together a list of good sites for Xmas papercraft for those visitors. One tip for you all, download models you are even vaguely interested in as good papercraft sites often disappear with frightening speed. Paper Models – The Christmas Kit — A piece of software to create Xmas papercraft you can use on an Apple IIgs emulator or just download the blank templates. 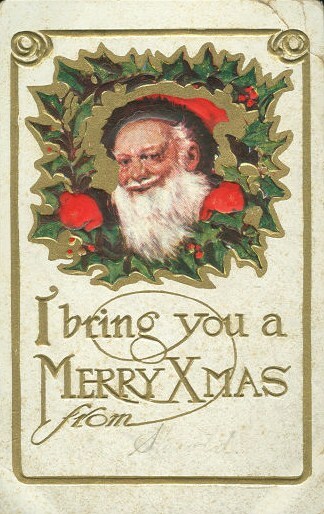 Some good sites for Xmas gift tags. Canon have a wide selection of Xmas papercraft models including decorations, an Advent calendar and even some masks. They have models for all skill levels. Christmas Paper Craft Canon CREATIVE PARK. They often retire models from this site so make sure to grab the ones you might like now, even if you don’t build them this Xmas. All about you has a huge collection of Xmas papercraft ideas. Nice pop up cards. These should be easy for you to make, just print the template onto coloured cardstock. Christmas pixel popup cards | Mini-eco. I’ve posted a good list of Xmas papercraft sites including a few more spots for pop up cards you might like. 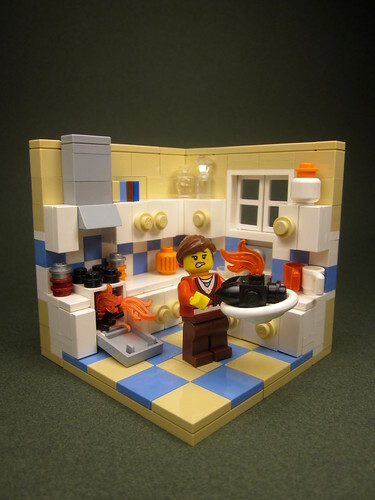 Excellent Thanksgiving Lego vignette. Never happen in my kitchen of course. This small vignette by Walter Benson just made me smile when I saw it. Now granted no one wants a burnt turkey for T-day, but his parts solution for a burnt bird is great and the flames coming from the oven and the woman’s expression are perfect.